CathNews - X & Y makes? x & y might remind audiences of chromosome symbols. Others might recognise algebra, mathematics and equations and formulas. And this is correct. This is the focus in this film – but much more. Morgan Matthews, a prolific documentary filmmaker, directed a documentary in 2007 about the international Mathematics Olympiad and the students involved. The story stayed with him and he decided to experiment with turning the documentary material into fiction narrative. 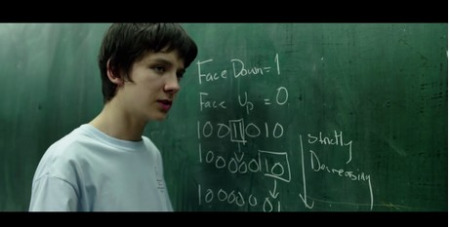 The centre of the film is, at first, a little boy, and then his growing into a teenager. The boy is shy, has little relationship with his mother, but bonds strongly with his father who plays with him, affirms him, lovingly encourages him. When the father is suddenly killed in a car accident, the boy seems to withdraw into himself. Audiences familiar with stories of children with autistic behaviour, will recognise that the little boy, Nathan, seems to be autistic but with a great talent for mathematics and solving puzzles. His devoted mother, Julie (Sally Hawkins) tries to reach out the boy lacks empathy for her. When she approaches the authorities at school, they recommend that special tuition from one of the teachers who had a strong maths academic record, suffers from a form of palsy, but works with special students, Martin (Reith Spall). Nathan works with him for several years, making progress with Martin’s care and attention. When Nathan becomes a teenager, he is played by the talented Asa Butterfield (The Boy in the Striped Pyjamas, Hugo, Ender’s Game). Martin is keen that Nathan participate in the Mathematics Olympiad. Nathan agrees and goes, for the first time in a plane, to Taiwan with the British candidates for the competition. Chaperoning them is Richard (Eddie Marsan, who worked so effectively with Sally Hawkins in Mike Leigh’s Happy-go-lucky). The Chinese official has a niece who is a candidate in the competition and who makes some kind of connection with Nathan. The students are very bright, some genial and friendly, others, possibly autistic, tend to be focussed on themselves and communicate arrogantly. This is all very new to Nathan, reticent during the classes, just managing to get himself as one of the chosen ones for the Olympiad. The ending is not quite what it might have been anticipated, especially as regards the competition. The British know how to make this kind of film, quite modest in scope, a very effective cast, a low-key treatment of emotion. But hopeful. Starring Asa Butterfield, Sally Hawkins, Rafe Spall, Eddie Marsan, Jo Yang. Directed by Morgan Matthews. 111 minutes. Rated M (Mature themes and coarse language).